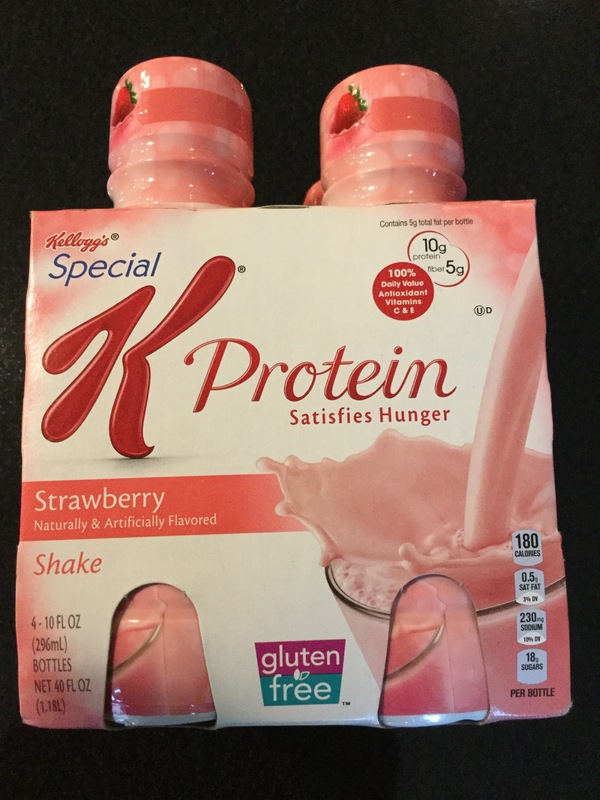 This Kellogg’s Special K Protein shake was gifted to me from the heart of a loving woman. In my last post, I expressed a little attitude (my opinion) toward food manufacturers and their attractive but deceptive advertising practices. When I wrote the post, this shake is the type of food I had in mind. This package is dolled up like it’s a birthday gift or something. Lol!! There is no doubt in my mind that the target market is women whose goal is to lose weight and/or maintain a healthier lifestyle. The pink is overkill and offensive to me. I could take this post to another level and compare the packing of a similar project to our male counterparts, but I won’t. Sigh! With so much talk about “protein” in the fitness world, no wonder it is the focus of this product. Come on ladies!! Get your protein! The woman who purchased this for me is aware of my fitness passion. While her intentions were good; there is no way, I would drink this crap. 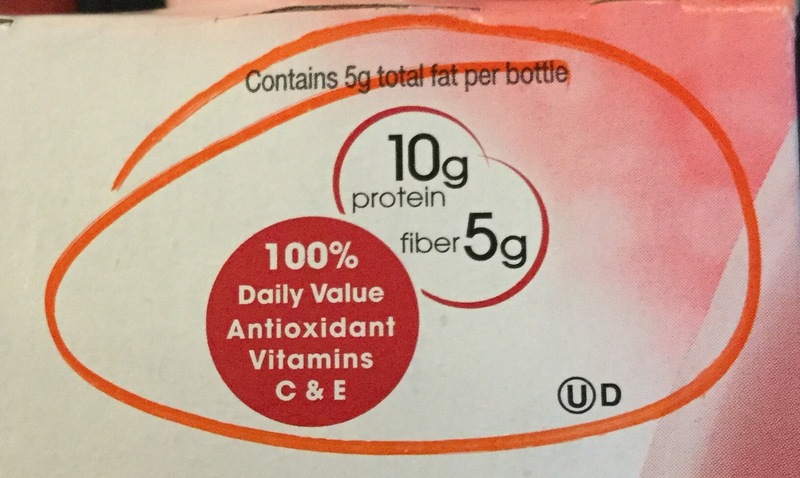 Of course Kellogg’s want you to believe that the protein in this beverage is going to “satisfy your hunger.” Yeah okay, right! Wink..wink. How the heck is a 10 ounce bottle of this stuff gonna satisfy my hunger before or after a workout? While plant and animal based proteins are the most satisfying, I am certain that this 10 ounce beverage is not going to do it for you… That’s just my opinion. Look at the label. 18 grams of sugar!! Whoa! Sugar is the devil and is linked to so many preventable illnesses. Make sure you read Kristen Kirkpatrick‘s article, 1o Things You Don’t Know About Sugar. I hope that it is an eye-opener for you. Since I don’t know what some of the ingredients are, I decided to read up on a few. maltodextrin may come from corn, cornstarch, rice, or potato starch. It can also come from wheat. The starches are cooked then acids or enzymes are added to break it down further, before resulting in a white powder. Someone with celiac disease should use caution when consuming maltodextrin and should consult their physician. You should also know that this addictive is commonly found in nutritional drinks, sugar substitutes, granola, coffee, commercially baked goods, even those labeled gluten-free, pie fillings, sauces, puddings salad dressings, candy, chocolate, sugar substitutes, canned fruit (Eeeew), gelatin, and prepared soup products. Read labels! 2. Polydextrose – Two words: synthetic fiber. It was patented in 1973 and approved by the FDA in 1981. Although it is not grain fiber, the FDA classifies it as “soluble fiber.” Personally I would rather get my fiber from a natural source such as oatmeal (steel cut oats), beans, brown rice, brown rice and vegetables. 3. Natural & Artificial Flavors – The FDA describes artificial favors as a substance that “…..is NOT derived from a spice, fruit or fruit juice, vegetable or vegetable juice, leaf or similar plant material, meat, fish poultry, eggs, dairy products….” Do you see strawberries listed anywhere in the ingredients? Nope! But lovely images of strawberries are plastered all over the the product. Really?!? 4. Gellan Gum – This is a microbiological gelling agent that serves the purpose of thickening or “anti-settling agent. It does not alter taste but is commonly used in soups and sauces. ” You can read about the effects of Gellan gum in humans here. 5. Potassium Citrate – Livestrong reports that PC can be found naturally in foods, but is also used as a food additive to stabilize foods and to regulate their acidity levels. For a list of foods that naturally contain potassium, click Here. Potassium Citrate is also used as a prescription medication used for several medical conditions, including kidney stones. Learn more about potassium at one of my favorite sites, The world’s healthiest foods. 7. Carrageenan – Another food stabilizer and thickening additictive. It keeps yogurt smooth and creamy and is commonly used in dairy and meat products. It is said to have a strong binding ability. There are articles that are pro and con carrageenan, but this is one ingredient that I have been avoiding for over year now. Carrageenan appears to be natural because it is actually extracted from seaweed; however, it is in the processing that changes into a “degraded”carrageenan. Stay with me here. In some experiments it has been linked to inflammation. The International Agency for Research on Cancer list degraded carrageenan as a possible carcinogen. Lab studies have also shown that it can induce inflammation. 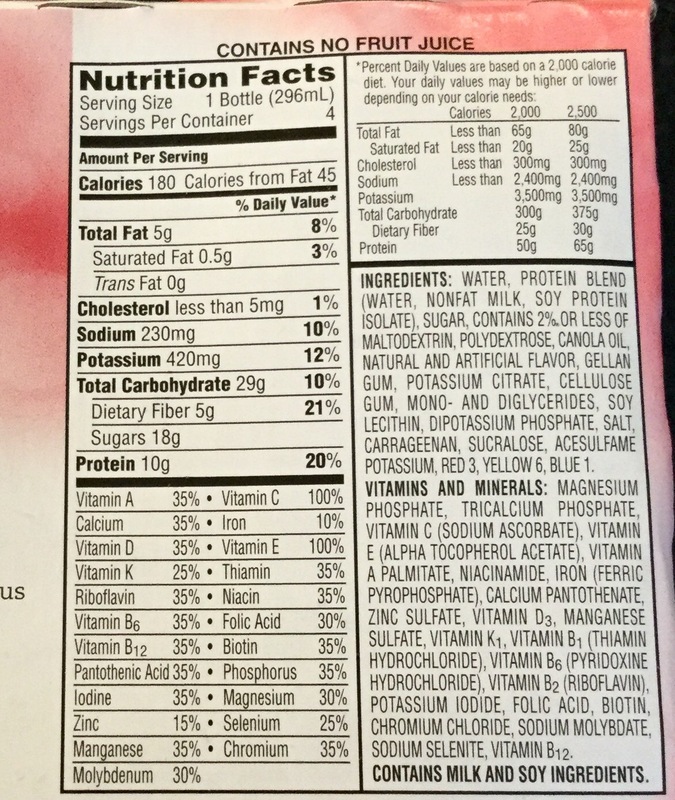 carrageenan may be present in the final product but not listed on the ingredients label when it is used as a processing agent. Fifteen million pounds of food dyes are sold every year in the US. Food dyes are used to make food visually more appealing to consumers. Reds are brighter, greens are greener, etc… And in the case of this strawberry protein shake, which does not have any strawberries in it, the dye deceptively gives it a pink color which tricks you into believing that the beverage contain strawberries. Smh! There is a plethora of controversy over food dyes. Red #1, #2, and #4 all have been banned, but #3 is still used today. Multiple studies suggest food dyes are linked to ADHD, certain types of cancer and other illnesses. Yellow #5 and #6 are also of concern, especially to parents of young children. Studies have shown increased hyperactivity in children who are exposed to the dyes. When our son was younger, I witnessed the effects of food dyes on his behavior, and decided to limit his exposure. Hence, he was no longer permitted to eat any foods before school that had any traces of food coloring. This decision helped him to focus better in school. Hubby wasn’t convinced until he witnessed the effects one day during football practice. It was our son’s birthday, so earlier in the day, he enjoyed cake and cupcakes that were slathered in red and blue icing. Later during football practice, it was obvious that he had trouble controlling himself. I laughed. I apologized. Then I explained the reasons for his behavior. It was so uncharacteristic behavior of our son that the coach was literally scratching his head. I remember looking at my husband and asking him, “Now do you believe me?” LOL!! I think it was at that moment that he understood the affects of sugar and food coloring on our son. Blue #1 and #2 are listed as another food coloring of concern. In addition to asthma, ADHD comes up again. There is a pattern linking ADHD to various food coloring. Although there is so much to say about this beverage and other foods, I think you get my point… READ LABELS. The more informed you are, the better choices you can make for you and your family. Thanks for dropping in and Happy Tuesday! This entry was posted in Family Living, Fitness, Healthy Eating, Healthy Living, Inspiration and tagged everyday living, fit mom, fit women, Fitness, food coloring, food ingredients, food labels, gluten free, healthy, healthy-living, lifestyle, Nutrition, protein, protein shakes. Bookmark the permalink. Oops. I am moving in the direction of eating less processed foods; I can live without carrageenan and other additives of this kind.